Would you get a tattoo of a company logo? Do you love a company so much that you would get a tattoo of its logo? And what would that say about you and the firm in question? 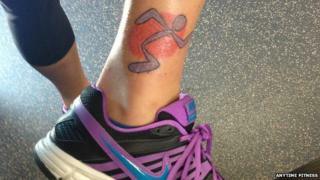 Chuck Runyon, the founder and boss of US gym chain Anytime Fitness, says he is very proud of the fact that more than 2,000 people around the world now have his firm's logo of a running man tattooed on their bodies. The phenomenon started in 2004 when a company manager was the first to get the tattoo for a dare, but customers soon followed suit. Today a constant stream of the gym's members continue to get the tattoo, and the business promises to reimburse everyone who sends in a photograph with an explanation as to why they got inked. Typically this costs the company about $100 (£58) per person, but Mr Runyon, 45, says the financial incentive has nothing to do with why people get their body art. "Hundreds and hundreds of people have told us why they got the tattoo, and it has never been about the money or the brand," he says. "Instead the answers are always very, very personal. Many say they got the tattoo to mark the fact they had achieved something they never thought was possible, such as losing a considerable amount of weight, or feeling healthy." Mr Runyon often gives the example of Susan Bock, a customer from Colorado. Anytime Fitness helped her lose 150 pounds (68kg). Ms Bock, in her early 50s, says the firm gave her "her life back", and she got the tattoo to celebrate, according to Mr Runyon. But as a company, does encouraging customers to get a tattoo of your logo affect the strength or value of your brand? Independent brand consultant Rebecca Battman says it is a smart move. "It is absolutely positive for any business if people feel such a strong affinity with its brand that they will indelibly mark their bodies - that is a pretty high level of commitment," she says. "It demonstrates a real emotional commitment to a brand, and shows how much brands have come into different aspects of our lives - they are no longer just about a product or experience. "And people now often feel strongly that they share the same fundamental beliefs or attitudes of a certain company." Fellow brand expert Robert Jones, professor of branding at the University of East Anglia, agrees, saying that there is little risk to a firm's reputation if people start getting its logo tattooed, "because tattoos have changed from being something subculture to something mainstream and, within reason, respectable". Prof Jones adds that companies instead get customers who are prepared to be free promoters of the brand, and that it helps firms to build a community around themselves. Mr Runyon, who himself has a tattoo of the company logo, says that creating a strong affinity with its gym goers was a key aim of Anytime Fitness ever since he founded the business in Minnesota in 2002. A veteran of the gym industry in the US, he explains that instead of focusing on impossible to achieve images of body perfection, he wanted to remove this intimidation. So staff are reminded that most customers do not enjoy exercise, and should instead be more gently encouraged and supported to reach achievable goals. Mr Runyon says that such an approach goes a long way to explain why so many Anytime Fitness customers get its logo tattooed - the company works hard to make them feel good about themselves, and that they belong to a caring community. Such an approach has also of course helped to fuel the business's commercial success, along with allowing users to access the gym 24 hours a day, even when no staff are present. As a result, it now has more than 2,400 franchised gyms across 19 countries. Yet these days the company is far from alone in seeing customers get tattoos of its logo, particularly in the wider fitness and sports fields. Another business that is seeing a growing number of people get its logo permanently marked on them is extreme obstacle course organiser Tough Mudder. Founded by Will Dean in New York in 2010, its events are tremendously popular around the world, despite entrants having to swim through icy water, crawl though mud and dodge electric wires. Tough Mudder claims that more than 3,000 people now have its logo tattooed on their bodies, something which Mr Dean says makes him proud and shows that Tough Mudder "very clearly stands for something". "Life is a series of obstacles that have to be overcome, and Tough Mudder has very clear values to help people do that. "We stand for things like fun, teamwork, camaraderie and challenge." Benjamin Voyer, an associate professor at ESCP Europe Business School, says there are a number of reasons why more and more people are getting tattoos of brand names, such as showing togetherness with other enthusiasts, or boosting their own sense of self worth. But what is the chance of someone getting a tattoo of a company name, and then going on to regret it a number of years down the line? Prof Voyer warns that while tattoos are pretty permanent, brands can change or disappear altogether. "As brands undergo identity changes, such as becoming less exclusive... consumers might be inclined to regret the permanent association they have created," he says. He adds that brands can also go on to be involved in scandals, or simply no longer exist following a takeover. "People have to ask themselves if they are still going to feel the same about a brand in 20 years' time."